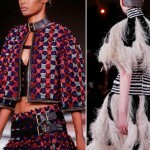 I was really taken by the beauty of McQueen’s blooming fall 2012 collection. 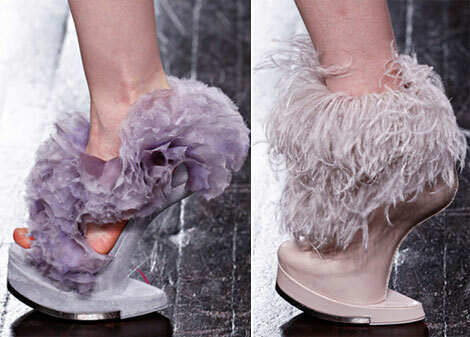 As usual, the McQueen shoes came to spice up the fashion game, in no way tamed or discrete. With shapes reminding me of Nina Ricci’s shoes, or the hoof like, heel – less footwear that was very fashionable not long back (remember even Victoria Beckham was a fan). The metal edge on the soles or the furry ankles and covers point towards hoofs too. How’s that working with flowers? It’s all about nature, I guess… Horses, flowers… McQueen. 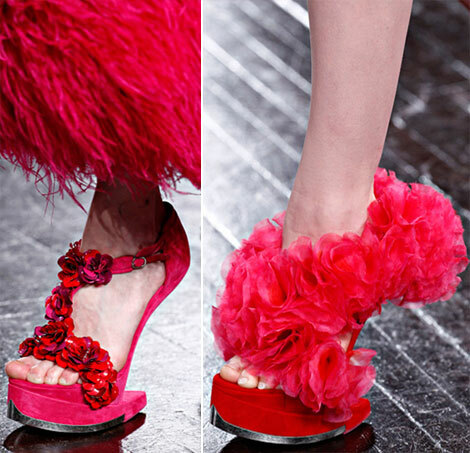 Either way, if you want fierce shoes for fall and you’re not interested in comfort, try McQueen shoes! It’s a house trademark to make a challenge out of each step! Lots of models have ugly feet. Ever noticed? Or it’s the artsy-fartsy look of the ‘shoes’ that don’t care for ergonomics. Often it’s the wrong size. It’s not that bad here but considering that these are teen legs…. I’m always intrigued by photos like that. It’s total BS that great shoes can not be comfortable at the same time. These are like pieces of sculpture to me more than footwear, but they are rather interesting looking and stylishly daring.